The Columbia River - "Wartime"
This first American military post in the Pacific Northwest was established in May 1849 in response to killings of Marcus and Narcissa Whitman in 1847. On March 26, 1856, Native Americans of the Yakama, Klickitat, and Cascades tribes attack American settlers who were living along the Cascade Rapids. Ten settlers and 3 soldiers were killed. The Cascade Rapids were four and one-half miles long located in the area of today's Bridge of the Gods and the Bonneville Dam. The first fort was Fort Gilliam, established in 1848 and located at the upper end of the portage as a supply depot for the Cayuse Indian Wars. Next came Fort Cascades, built in 1855 at the lower end of the rapids, and built to defend the portage. Fort Rains was located at the lower end of the portage around the "Upper Cascades". The last fort built was Fort Lugenbeel, located at the upper end of the section. The Vancouver Barracks Post Cemetery was established in 1882 and is located north of the main Barracks compound. Four Medal of Honor recipients are buried there: First Sergeant James Madison Hill (Indian Campaigns), Major William Wallace McCammon (Civil War), First Sergeant Moses Williams (Indian Campaigns), and Private Herman Pfisterer (Spanish-American War). In 1862, during the Civil War, Cape Disappointment was armed with 22 smoothbore cannons to protect the mouth of the Columbia River from enemies. It was generally known as "Fort Cape Disappointment". It wasn't until 1874 that the cape was given the name "Fort Canby." to honor General Edward Canby, who was assassinated druing the Modoc Indian Wars. Fort Canby was closed after World War II. In 1865 Fort Stevens, on the Oregon side of the mouth of the Columbia River, was built to protect the North against an English invasion from Canada, should the British join the Civil War on the Confederate side. The area of today's Ridgefield, Washington, was first settled in 1839 when Irish immigrant James Carty took up residence on Lake River. In 1852 and 1853 Arthur Quigley and Frederick Shobert arrived and settled on property next to Lake River. Both settlers established mud landings on their properties where river steamers could offload their goods and take on loads of farm products. Thus, "Shobert's Landing" became the common name for the area. According to the U.S. Fish and Wildlife Service, Ridgefield National Wildlife Refuge Comprehensive Conservation Plan (2010), the community got its next name, "Union Ridge", during the Civil War. According to a reporter who visited the area in 1875, this was because "all the settlers, save one, were outspoken Union men". When the first post office was established in 1865, the name became official. The post office name was then changed to Ridgefield in 1890 at the urging of the new postmaster, S.P. Mackey, who was originally from Virginia, and not keen on the name Union Ridge. According to the "Columbia-City.org" website (2016): "During World War I the Sommarstrom Brothers built a shipyard with four bays - to build four ships at once - in the South part of Columbia City where River Club Estates is now located. They hired a large crew and built wood ships for the U.S. Government. When the war ended, the ship contracts were cancelled." According to the "shipbuilding.com" website (2016), the Grant Smith-Porter Ship Company began in 1917 with a yard in Aberdeen, Washington, and another yard in St. Johns, Oregon. Twenty-eight wooden cargo ship hulls were built at the St. Johns' yard between 1918 and 1919. During World War I, today's Pearson Field in Vancouver, Washington, became the home to a large spruce mill, supplying wood for planes for the War. According to Bonneville Dam District National Register of Historic Places Nomination Form (1987): "During World War II, Bonneville was the focus of concern as a target for attack or sabotage. During the war the Corps employees painted all of the buildings green, including the roofs. Even the gravel and blacktopped roadways were painted with camouflage. The Corps mounted concrete "pill boxes" to flank the main entry road mid-way between the Auditorium and the railroad viaduct. Other concrete guard stations, with gun ports, were set up near the dam and powerhouse on Bradford Island. Additionally in 1942 the Corps experimented with smoke screening, filling the gorge with dense clouds of partially burned diesel fuel ejected from nozzles and from an open ditch on Bradford Island. None of these precautions was tested. The Bonneville Project emerged unmolested from the war." During World War II, three Kaiser-owned shipyards were located along the Columbia and Willamette Rivers. One was located along the Columbia River in Washington State at Ryan Point, Vancouver (Kaiser Shipyard), and two were located along the Willamette River in Oregon at St. Johns (Oregon Shipbuilding Yard) and Swan Island (Swan Island Yard). On September 27, 1941, the Oregon Shipbuilding Yard launched the region's first liberty ship near the St. Johns bridge. Portland's Exposition Center was used as a detention center for 3,500 Japanese Americans during five months of 1942. The Expo Center was known as the "Portland Assembly Center" and served as a staging center for the internees' relocation to Hunt, Idaho facilities. Vancouver, Washington's "Remembrance Wall" was painted in 2005 to honor military veterans from World War II to Vietnam. 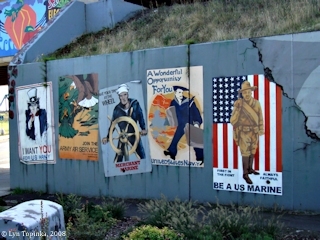 Commissioned by the Clark County Mural Society, the mural is located just west of the Railroad underpass at Columbia and 4th streets, on the north side of a 550-foot-long retaining wall owned by the Burlington Northern Santa Fe.